Southgate is a favorite among retired players because of its laid back feel. This 6,100-yard par-70 layout features two distinctly different nines. The front side is relatively flat and cris-crosses the lazy Santa Clara river. Although not a long course, with eight of the nine holes requiring shots over or around water, golfers must bring their "straight-shooting" clubs. Five holes on the front nine have been redesigned over the past two years. The favorite hole here is the newly remodeled par-four seventh. After a tee shot that must avoid the river on the right and out-of-bounds on the left, players must hit an approach shot over a lake to an undulating green with water right and two deep grass bunkers behind. The new seventh hole epitomizes Southgate's demand for accuracy. When playing the back nine at Southgate, bring your camera. 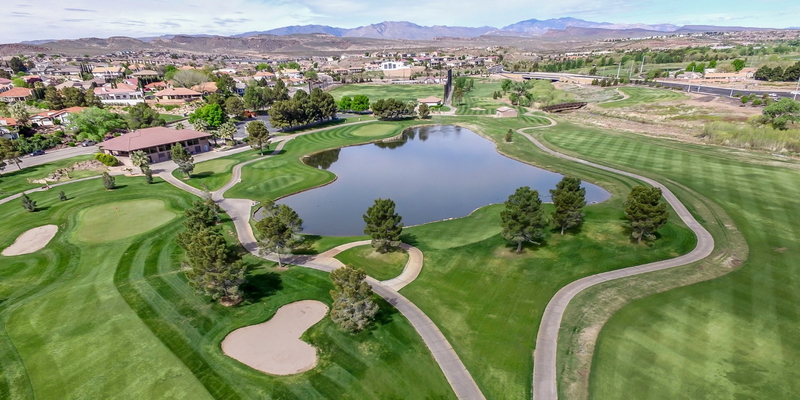 These nine holes traverse along Tonaquint Mountain and provide awe-inspiring views of the St. George area. Again, this course is not overly long. The key to successful navigation is keeping the ball in the fairway. As with most mountain courses, the greens on Southgate's back nine slope from back to front. Remember to always keep your approach shot below the hole and you will most likely end up with a scorecard worth showing off to your friends. Please call 435-628-0000 for current rates. Call 435-628-0000 for rates and tee times. Contact Southgate Golf Club at 435-628-0000 for more information and details on holding a golf outing at the course. Contact Southgate Golf Club at 435-628-0000. Contact Southgate Golf Club at 435-628-0000 for onsite or nearby dining options. This profile was last updated on 02/09/2016 and has been viewed 6,991 times.